Portraiture as an artistic tradition emerged from the rise of the European bourgeoisie. It was a mirror that a new ruling class held up to itself, better to preen. That portraiture has largely been limited to representing political and economic elites whose lives are considered heroic or otherwise exemplary is not lost on any visitor to the National Portrait Gallery, which is home to the “nation’s only complete collection of presidential portraits outside the White House.” But right next to the presidential portraits, a new exhibition, “The Sweat of their Face: Portraying American Workers,” on view until September 3, 2018, seeks to rethink and expand portraiture. Curated by Dorothy Moss, the Portrait Gallery’s Painting and Sculpture curator, and historian emeritus David C. Ward, the nearly 100 objects offer representations of American workers from the antebellum era to the present. Resisting the subsuming and homogenizing quality of laboring, the depictions instead aim to individuate and elevate the American worker. In doing so the exhibition enacts a democratization of the subject and medium of portraiture. The objects on view range from classic oil on canvas to a 3D printed sculpture. While this inclusive gesture broadens who is considered worthy of a portrait—an important aim of the exhibition—it also raises the question of in whose name and for what purposes this democratization is enacted. 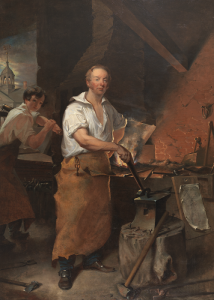 As John Fagg argues in his essay for the catalog, there is a tension “between treating workers… as portrait subjects,” which emphasizes “individuated character and investment in a particular life story,” and “depicting them … within the genre tradition” with its “use of stock types intended to stand for common experience.” Throughout the exhibition, the work of portraying American workers both elevates the individual and at the same time demands that the worker represent something more than herself. Emblematic of this tension is a panting we encounter early in the exhibition—John Rose’s 1785-1787 watercolor Miss Breme Jones. 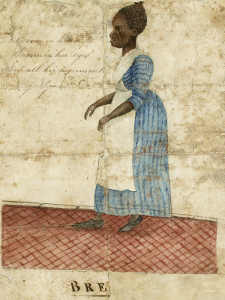 Miss Jones, an enslaved woman owned by Rose, cared for his children after his wife’s death. Rose gestures at the intimacy of this labor in the background of the portrait: he inscribed a verse from Paradise Lost in which Milton describes Adam’s adoration of Eve. Separated by just a wall from the presidential portraits, the painting of Miss Jones makes visible what is absent next door and radically expands the subject of portraiture. At the same time, the in-motion, unsmiling portrait atop the sentimental verse conscripts Miss Jones into the role of the forbearing and loyal slave. That a woman who did not own her body could not own and direct her image goes without saying. Nonetheless this tension between individuating portrayal and generic depiction recurs throughout the exhibition and illuminates the kinds of affective, social, political and ideological labor that portraits of workers are asked to do. The exhibition announces this idea with John Neagle’s Pat Lyon at the Forge, a large 1829 painting. Lyon, who was imprisoned after a false accusation of theft, embodies both man’s fall and the redemption that labor affords. With the jailhouse, a symbol of his fall, in the far distance behind him, Lyon stands with one hand on his hip, a hammer placed on an anvil in the other. His gaze exudes confidence, his open shirt and wide-legged stance invoke manhood. This is the self-made man of the nineteenth century, a man with, as they called it then, a “competency.” However, as Ward informs us, “Lyon’s status as worker was tenuous at best.” He was a successful businessman who sought to be depicted as a workingman. While the life of a businessman suggested unproductive labor, speculation and possible corruption, the artisan, independent, productive, and honest, was the consummate republican citizen. Behind Lyon, Neagle portrays a young, unidentified apprentice, looking admiringly towards Lyon. The ersatz craftsman represents the future he hopes awaits him. But as the industrial revolution takes hold and mass production comes to displace artisans, that future will no longer be available to the young apprentice. Already in the early decades of the nineteenth century, artisans found themselves reduced to wage labor. And while the artisan’s rural counterpart—the yeoman farmer—persisted further into the nineteenth century, both figures would come to be displaced in the rise of large-scale production. A number of artists wrestle with this transformation in all of its promises and perils. For instance, Winslow Homer’s 1868 wood engraving titled New England Factory Life—“Bell Time” calls attention to the growing number of women who would begin to work outside of the home, a theme that recurs in his 1871 painting Old Mill and his wood engraving Song of the Sower completed the same year. These later depictions idealize and romanticize women’s work in the mills. For instance, with a pastoral background, Old Mill depicts a woman leaving behind agrarian life and ascending to a future of industrialization. Yet in the 1868 engraving, Homer appears less enthusiastic about this ascension. The march of the workers at the end of day captures the drudgery of the workplace they have just left. On the right side of the engraving, a woman with her shoulders slumped, neck strained, and eyebrows furrowed after a 13-hour work day evokes dread—perhaps as she contemplates the work that awaits her at home and her return to the mill the next day. Her pensive and resigned gaze sharply contrasts with the bobbin girl of Song of the Sower who stands upright and works methodically—the fruits of her labor featured prominently at her side. Elsewhere in the exhibition, Lewis Hine’s 1930 Workers on the Empire State Building photograph depicts a steelworker hanging perilously and confidently in midair, highlighting the ways that new technologies of the industrial revolution take human labor to superhuman heights. At the same time, his depictions of child laborers illuminate the dark depths of industrialization. In Hine’s famous 1908 photograph, the young child is far from the camera lens, almost blending into the mechanical background. Similarly, his Powerhouse Mechanic (1920-21) highlights the blurring of human and machine. Like Neagle’s Pat Lyon, Hine’s Powerhouse Mechanic links masculinity and labor, as both men’s muscular physiques call attention to the embodiment of labor and the indelible marks of toil. But separated by almost a century, these two depictions of the American worker are striking for their divergence. While Lyon stands self-assured and meets the gaze of the viewer directly, the mechanic is bent over before the machine, his face largely invisible. The former is his own master while the latter appears enslaved to the machine’s whims. At the turn of the century, the Knights of Labor and other radical labor movements would mobilize the language and metaphor of enslavement to critique the new era of industrialization. The transformation from artisans into wage laborers, they argued, eroded their independence and subjected them to arbitrary power. While industrialization had largely eliminated forms of personal dependence associated with chattel slavery and feudal societies, Alex Gourevitch has recently detailed how a cohort of labor activists and intellectuals argued that economic dependence persisted in the compulsion to labor for another’s profit. Far from creating the conditions for independence and self-mastery, industrial labor was tantamount to wage slavery as workers without property were compelled to seek employment and the labor contracts that governed their work gave extensive power to employers. America’s faith in the redemptive power of labor has, from the very beginning, been tangled up in the contradictions implicit in its dependence upon enslaved labor. Due to the nation’s self-understanding as free from the aristocratic privileges of the old world, as the land of immigrants and of the self-made man, the idea of labor as a form of salvation and self-emancipation has long had a distinctive hold on the United States. At the same time, living in a country founded on chattel slavery, Americans have also anxiously worried that rather than redemption, labor threatened a denigration associated with enslavement. This anxiety is captured in the distortion and disembodiment we view in Josh Kline’s 2015 assemblage Nine to Five. The illuminated, 3D printed sculpture of a janitor’s cart displays the severed head and hands of the janitor alongside the instruments of his labor—brushes, spray bottles and Lysol. The collapse of any distinction between the person and his work is suggested in the hand gripping the disinfectant, which, instead of skin, is also encased in the Lysol brand. The United States has often sought to reconcile this Janus-faced character of labor by casting its denigrating and dehumanizing components to those excluded from full citizenship. As the political and legal theorist Aziz Rana has argued, the vision of American freedom as self-mastery and independence depended in its inception on indigenous dispossession and African slavery. It was expropriated lands and the genocide of native peoples that provided the physical space and natural resources for the ideals of the independent yeoman farmer and artisan. Enslaved men and women relegated to the routinized mass production and reproduction of plantations accomplished the menial labor that freed white citizens to pursue higher ends. Even after emancipation, the legacy of what Rana calls the two faces of American freedom persisted as the descendants of the enslaved and new waves of immigrants continued to be relegated to the harshest and most invisible forms of labor. From the 1860 photograph of a slave woman with two white children by an unidentified artist to Elizabeth Cartlett’s 1952 portrait of a woman sharecropper, from Isaiah Taber’s Chinese Butcher and Grocery Shop (1887) to Ramiro Gomez’s Woman Cleaning Shower in Beverly Hills (2013), from Hine’s Young Jewess Arriving at Ellis Island (1905) to Richard Avedon’s 1979 photograph of an unidentified migrant worker in Texas, the exhibition reminds us that the American workforce has always been transnational. Physically coerced as well as politically and economically compelled, workers have found themselves in this land and sought by their labors to make a home for themselves. But while their labor has been and continues to be central to the making of the United States, they are “impossible subjects”—to borrow the historian Mae Ngai’s apt phrase. Their claims to full citizenship, their demands to inhabit the first face of American freedom remain unanswered. Gordon Park’s 1942 photograph of Ella Watson illuminates this tragic fate. 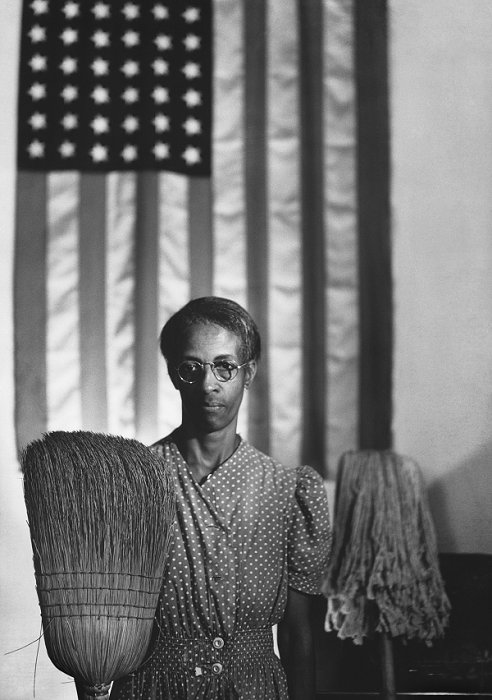 Citing Grant Wood’s iconic painting American Gothic (1930), Watson, a worker at a government building in Washington D.C., poses in front of an American flag with a broom in one hand and a mop in the other. Despite working in a federal building, her relationship to the nation in an age of Jim Crow is a vexed one. 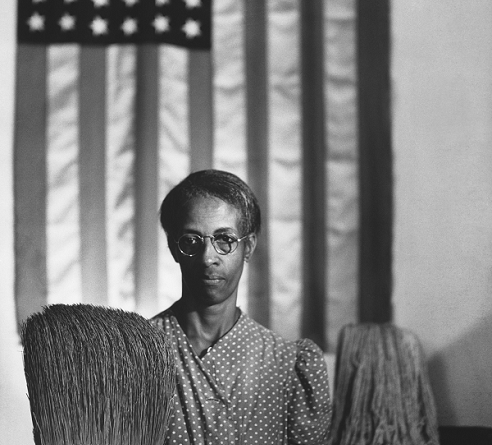 Her labor as a cleaning woman and her raced and gendered body mark her as a subject rather than a citizen. Just like artists who captured the rise of industrialization, we are living through another crossroads in the history of American workers specifically and modern labor more generally—one that threatens to erode the always-unstable line between dignified and denigrated labor and between citizen and subject. While political elites pine for the good old days of American industry, technological advances and a shifting global economy have radically transformed the American workforce. According to 2015 Bureau of Labor statistics, there are 64,000 steelworkers and 820,000 home health aides in the United States. Last year, the three largest private employers in the country were Wal-Mart, Kroger and Home Depot. Shauna Firschkorn’s Kean, Subway Sandwich Artist (2014) considers this contemporary condition. In this appropriation and reworking of Renaissance portraiture, Firschkorn calls attention to and resists the homogenization and anonymity that this new labor regime imposes. 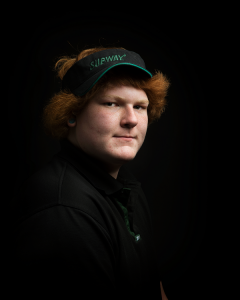 Kean is dressed in his Subway uniform—one that he shares with countless other workers, but as his black shirt blends into the background, his face appears illuminated, his gaze and pursed lips suggest dignity and determination. As its name suggests, the piece takes seriously the mocking job title—“sandwich artist”— affixed by the employer to its employees. But while the portrait of Kean highlights the subversion that appropriations of the portrait form make possible, it also reveals the form’s limits. Preoccupied as it is with the individual, portraiture appears unable to capture the sociality of labor, and the solidarity this sociality can produce. In elevating the individual worker, the social worlds that labor requires and reconstitutes are made invisible. The project of portraying American workers persistently runs up against what Fagg calls “the pitfalls of the heroic, iconic, or universalized individual.” These pitfalls require a return to and rethinking of class. Though associated with a homogenization and de-individuation, class attends to the collective character of work and has long provided the webs of connection that allow workers to transform the conditions of their labor. Far from homogeneity, the paradigmatic symbols of the organized working class—the union hall, the strike—quilt together a diversity of interests and visions that always threaten to fray and require reknitting. The age of Kean, Subway Sandwich Artist, the era of a new working class, requires a new “iconography of collective labor” as much as it does portraits of individual laborers.